There’s a story behind most interesting motorcycles, and so it is with this remarkable little machine. Between 1946 and 1948, Ducati produced the Cucciolo or ‘Puppy’, a motor-powered bicycle. 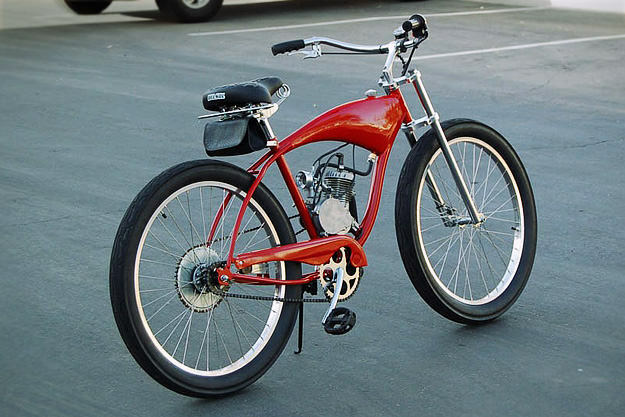 In 2005, Mark Savory and Bill Johnson decided to create a modern interpretation of the Cucciolo, using a 48cc 2-stroke single cylinder and the frame from a Schwinn single-speed pushbike. The frame was rebuilt to incorporate a gas tank, repainted, and fitted with new wheels and hub assemblies. The result is delightful; it’s one of many unusual Ducati bike projects detailed on the riveting DucCutters website.